You know all the cool quilters are making the adorable Camille's Swoon quilt not to mention hanging out at the Swoon-along with the fabulous Katy of I'm a Ginger Monkey. I'm still kicking myself for being too intimidated to talk to Katy at Quilt Market even though I was standing right next to her in line for like 20 minutes waiting to get our books signed by Sarah Fielke. LOSER!!! Anyway, I really wanted to Swoon but I didn't see myself making a whole quilt. I'd been brainstorming using it for the center of a medallion quilt or something like that but then I was digging through my stash and I came up with this pile of fabrics I'd put together for a baby quilt. I thought this could be big, really big! After playing with the math I decided to make a 32" Swoon block. Sorry, it was really dreary so I didn't take pictures along the way and it went together really quickly. Once I finished up the block I felt like it was a little small, even for a baby quilt, plus I wasn't sure you'd look at it and instantly know it was one of my quilts so I added the zigzags;-) I love the way they echo the lines of the block! I made these with HSTs but if I did it again I'd go with flying geese to reduce some of the seam allowance bulk. I also probably wouldn't use a directional fabric again. It definitely upped the level of difficulty to get all the bubbles going the right way. The finished top is 36"x52". 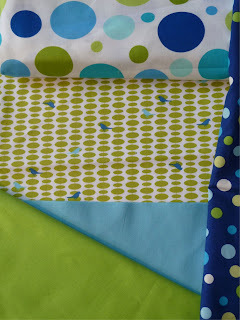 I don't have a big enough piece of spare batting so I will still get to make a trip to my LQS which gives me time to figure out how I'm going to quilt it. 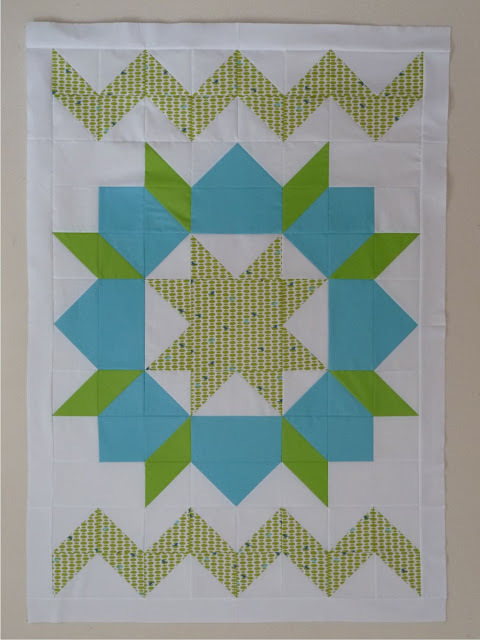 The unbelievably talented Angela has a great post about how to quilt your Swoon so I have lots of options to consider. And here's my tip for the day... this is the perfect time to make your binding. 1, it saves you from accidentally using the piece you had intended for your binding (been there, done that!). 2, you're still in the piecing groove. And 3, it is so nice to have your binding all ready to slap on as soon as you're done quilting. It makes finishing those quilts so much easier! ALICE!!! I love, love, love this. You are a genius with the zig-zag!!! REally beautiful!! I love the color combination! The zig zag is a nice addition...good job getting all the directional fabric to work-that's no easy feat!